Landscapers and contractors are demanding more cordless alternatives to gas-powered outdoor power equipment. Makita is meeting demand with an expanding line of cordless OPE that includes the 18V X2 LXT® Lithium-Ion (36V) Brushless Blower. With zero emissions and lower noise, the 18V X2 (36V) Cordless Blower is a welcome solution for clean-up applications. It’s powered by two 18V LXT® batteries for maximum power and run time, but without leaving the 18V battery platform. With the efficient Makita BL™ brushless motor, the blower delivers longer run time, increased power and speed, and longer tool life. Model XBU02PTX1 is a kit and includes the Blower, two fast-charging 18V LXT® Lithium-Ion 5.0Ah batteries and an efficient 18V Dual Port Rapid Optimum Charger. The kit also includes an 18V LXT® Brushless 4-1/2" Angle Grinder, which is equipped with an efficient brushless motor and Automatic Speed Change™ technology for corded grinding performance without the cord. 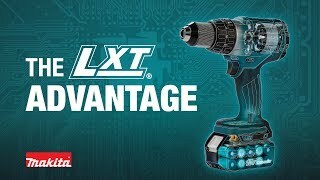 Makita’s efficient BL™ Brushless motor is electronically controlled to optimize battery energy use for up to 50% longer run time per battery charge than similar non-brushless tools. Electronic controls efficiently use battery energy to match the changing demands of the application for increased power and speed when needed. With no carbon brushes, the Makita BL™ Brushless motor runs cooler and more efficiently for longer life. 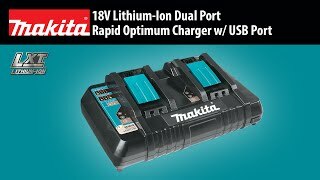 When powered by two 18V 5.0Ah batteries, the efficient brushless motor delivers up to 29 minutes of run-time on dial setting #3 on a single charge. 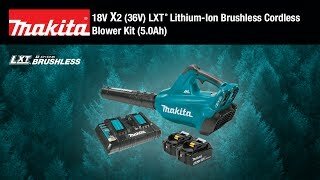 The Blower features Makita Extreme Protection Technology (XPT™). XPT™ is a protective seal inside the tool, and is engineered for improved operation in harsh conditions by channeling water and dust from key internal components. Net Weight (with battery) : 9 lbs. Shipping Weight : 24 lbs.